It's summertime here in the South and to me that means every time after a summer shower these big ole frogs that live around here come out and make a racket. I mean it gets loud and there is no mistaking that sound! For today I want to share with you Mr. Spring Peepers. 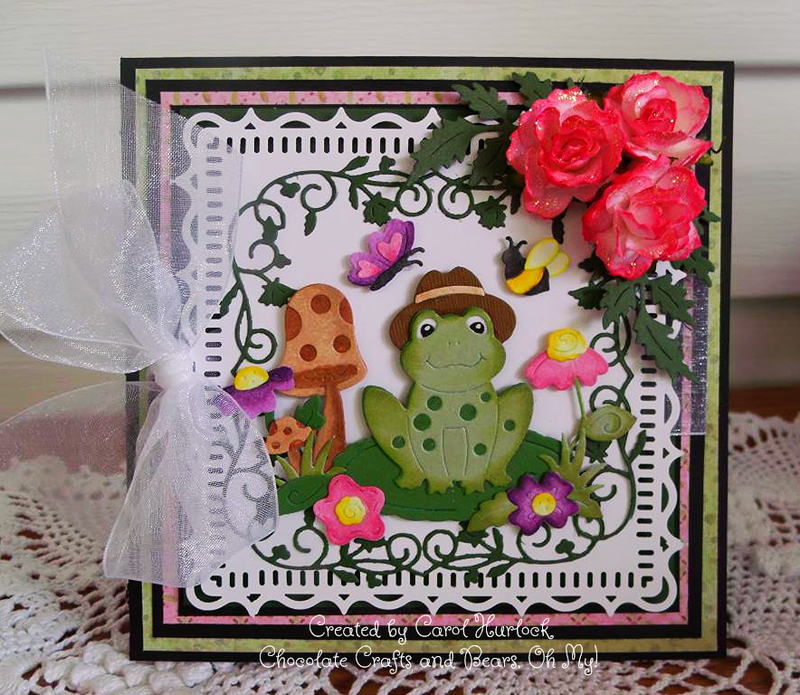 Isn't he just adorable with his hat sitting on his lily pad enjoying his day amongst the flowers. 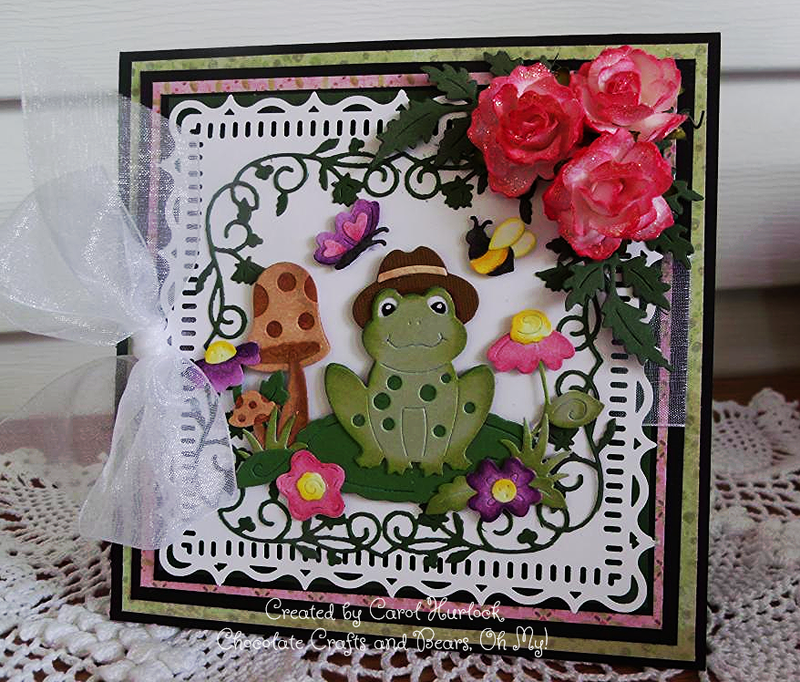 The frog, lily pad, leaves, and greenery were cut out from two different colors of green cardstock. Peeled Paint distress ink was used to shade Mr. Peepers. 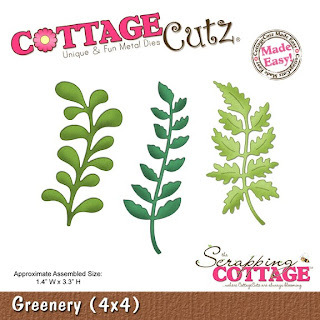 All the other pieces of the die were cut on white cardstock and colored with Copic Markers. The butterfly and the bee are so cute and I can see using them again without Mr. Peepers! 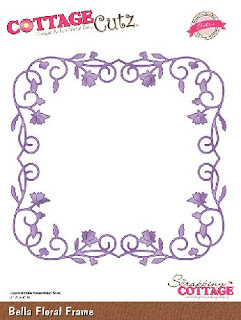 To create the card, Martha Stewart Punch Around the Page Flourish Lace was used punched on a 5 x 5 piece of white cardstock. 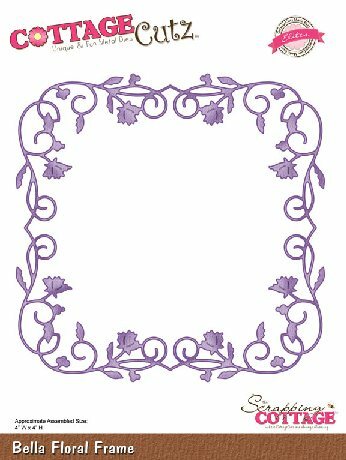 The Bella Floral Frame was cut with green cardstock and fits nicely inside the perimeter of the punched white cardstock and frames Mr. Peepers nicely. 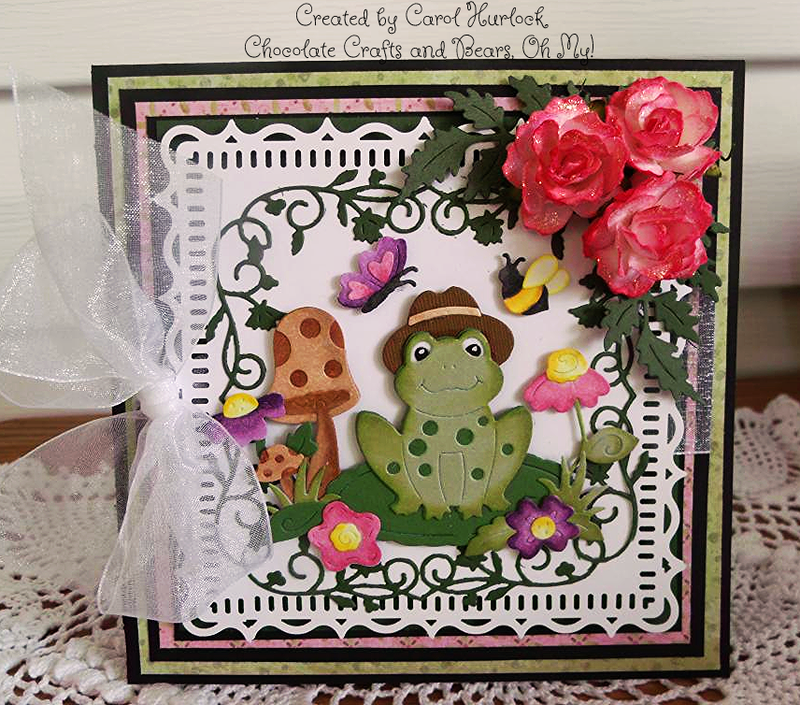 o this is super sweet and a gorgeous card Carol. 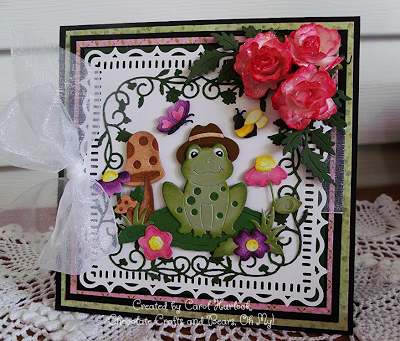 You have created a fun scene here - love the hat on the frog :) Great border around it too! This is so cute! 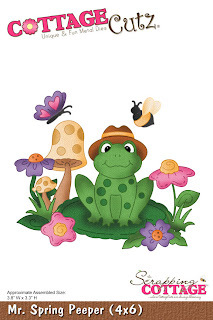 Now who could ever be mad at a frog for making racket when he looks this cute in a hat? Great card! Wow - this is soooo cute! 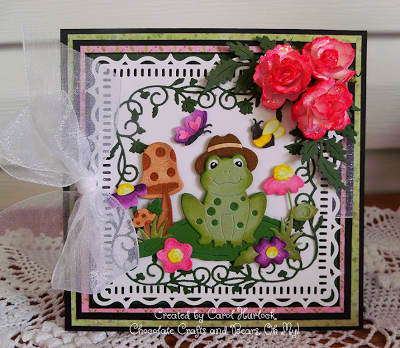 Love all the details and die cuts on this darling card. 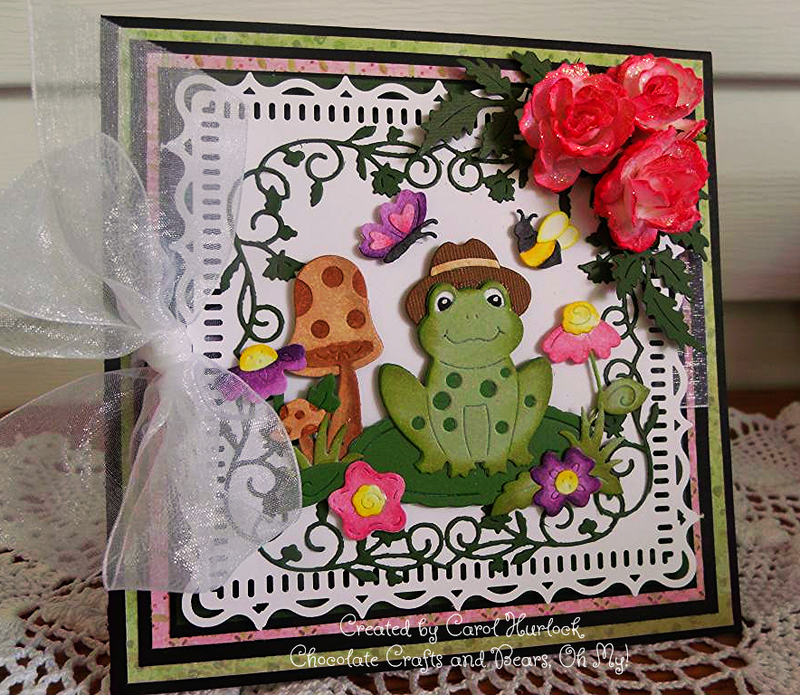 Very cute critter and gorgeous flowers. Wonderfully colorful and fun. Hugz!!!! Absolutely Darling Carol!!! 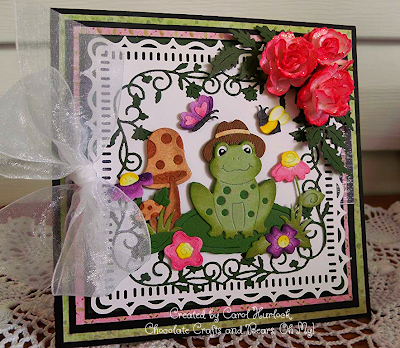 Love this and love the little frog,flowers,and mushrooms. Super CUTE!!!! This card just makes me smile!! So adorable and you created such a cute scene! All the layering and extra details make it extra special too!